History: Served as a pilot in the military for a while when he was younger, resigned after his wingmate's death and went to the private sector, where he uses his own (small) ship to run blockades and deliver Goods to Individuals. Which goods and which individuals is a topic he likes to avoid discussing. He stays on the right side of the law, just barely, most of the time. Attire: Pseudo-military. Likes to wear red-and-black camouflage, because he loves the concept for reasons he won't explain. Special abilities: Getting into trouble. Getting out of trouble. Quick thinking. Jury-rigging mechanics. Backyard distillery. Making do. He can fix most things, as long as you don't ask him to explain how it works. Kir’s family were good people. That was why they mostly tried to pretend that he didn’t exist. He couldn’t really blame them, these days. They’d gotten along a lot better back in the day, when he’d still been a military pilot. Straight as an arrow, just like the rest of them. To all appearances, anyway.... then things had changed. It hadn’t even really been a big event. Just another border skirmish along one of the fringes, the sort of thing that happened every day and completely failed to make the news. That one might have been the same for anyone else, but for him it had been different, because that had been the one that his wingmate hadn’t come back from. After that… well, after that things had been different. His CO had tried to get him to stay. Offered him as much leave time as he’d needed, and Kir supposed that if he wanted to be technical, the offer was probably still open - but he hadn’t needed leave time, he’d just needed to leave. There wasn’t really anything wrong with that, either, as far as his family was concerned, but then Kir had gotten back into working on the fringes. He’d scraped together his own ship, or enough of one that he could pull together the scraps and fill in the gaps whn he had the time and the money. It was a good ship, he thought, even if it was a little on the patchwork side. A lot on the patchwork side, really. Kind of like himself, he supposed. It’d been enough, running the borders, tempting fate. Moving goods and people without too many questions asked, trying to do the right thing when he could afford to, and acknowledging that the right thing wasn’t always the same to everyone. It might not have been the life for everyone, but it had been good enough for him. And then she’d called. His baby sister. He didn’t even know how long it had been since he’d seen her. She had kids of her own, he knew, although he couldn’t remember if there were seven or eight. He’d never met them. He guessed they must be in school now. They probably had been for a while, come to think of it. He supposed he could have told his sister to deal with her problems herself, whatever they were, but she was family. He just wondered what she’d managed to get herself into that was so bad that she thought she had to come to him, of all people. He’d agreed to meet her, though. After all, she was family. She’d picked an odd place to meet, out in the middle of nowhere - some sort of massive hunting preserve, he guessed. It’d been an hour hiking through the woods to get to where he was, and all he had to go on was a set of coordinates she’d given him. In a backwards sort of way, it reminded him of taking her out to the woods and “accidentally” getting her lost when they’d been little… though he supposed this was a bit too long to wait for revenge. Besides, she’d always been better at finding her way home than he had. He was still surprised how quickly he knew she was there, as he approached the clearing. He supposed some things didn’t fade. She wasn’t alone, either. He hesitated for a minute, but she’d already seen him. She called his name, and he gave her a nod, taking a mnute to look over the person with her. Half a person, really, or just about. A little girl. Must be one of the kids. ”What’s up?” he asked, neutrally, as if he’d just seen her a month ago and it hadn’t been longer than this little half-grown girl had been alive. Kir felt himself staring in disbelief, mostly at his sister, but partially at the innocent-looking kid beside her, standing silent, unspeaking. That was… not what he’d expected. ”Why?” Why did his always-good-sister need him to take one of her kids away? And what did the government have to do with it? He looked at the girl a little more sternly, judging. Is she… but no, she’s way too young for that… At least, he thought so. Wherever that train of thought had been headed, though, when his sister spoke again it was thoroughly derailed. Physical markings: Four vertical lines of tattoos down her back, two on each side of her spine, at a slight inward angle so that they're farther apart near her shoulders than at her waist. They glow blue when she's using her special abilities. Attire: Tends to wear a headband with cat ears. She saw some schoolchildren wearing them and decided it's her thing. Likes ribbons and frilly things and cute little dresses, but with shorts under them because she's not indecent. 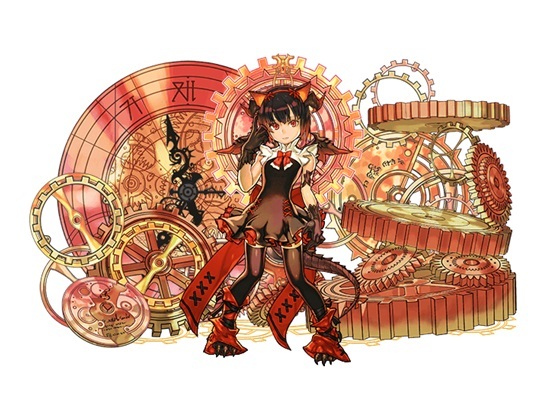 Likes: gears, cogs, analog clocks, spinning things. She finds them delightfully anachronistic. 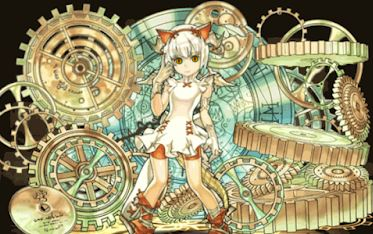 She's also fond of wires and electronics and mechanics of all sorts, much to her uncle's dismay. Miei sat quietly in a seat that was too big for her, and looked like it hadn’t been used more than half a dozen times in its existence. While the Epitaph had a seat for a copilot, it was obvious that her uncle preferred to fly it alone. She wasn’t sure about the name. The best ships were people. Ta’Ken’Ra. Xarath. Xan’Or. She might have been something like that. Perhaps not. It was hard to say what she might have been. Still. The best ships were people. She’d pointed that out to her uncle, one night, when he’d been feeling talkative. He’d just put a hand on the bulkhead, and asked her if she knew what an epitaph was. Which was a ridiculous question - of course she did. She had a very good vocabulary for a person her age. An epitaph was something to pay homage to someone who had died. She’d been about to tell him so, and then she’d realized that maybe he knew more about it than she did. It wasn’t in anything he said, but it was in the way that his hand stayed on the bulkhead when he’d asked. Epitaph. Oh. She hadn’t asked about it again. She thought about it, though, sometimes. She wondered if she’d ever ask, or if she did, whether he would answer. There were a lot of questions he didn’t answer, she noticed. Some of them were personal, and that was his own business, but others she thought he should have - like, where he was taking her. He’d just told her the less she knew, the better. And then when he thought she’d stopped looking, he’d get that grin. Like he was planning something that he definitely wasn’t supposed to do. Of course, pretty much anything he was doing with her wasn’t something he was supposed to do, so she guessed she would just have to live with it. He liked to talk to her about the ship, though. Miei had no idea how half of it worked. Half of the time it didn’t - he was always fixing something. Miei didn’t think most of it actually needed fixing, her uncle just didn’t seem to like letting it alone. He tinkered. Miei liked watching him work. He seemed most relaxed when he was cursing at something, in a strange way. For about three days, he’d tried to avoid cursing around her, and then he’d realized she was always around, and given up and put a pair of wire strippers in her hand and started explaining how to do what he was doing. She’d learned a lot about mechanics and wiring… and a lot of phrases that her mother would definitely not approve of. Which didn’t really matter, because Miei was never going to see her mother again. She didn’t think she’d really finished processing that information. She’d have to think about it some day, of course, but right now most of her thoughts were taken up in trying to get where they were going. There were some strange numbers on the indicator screen that she didn’t understand, but which seemed to be making her uncle unhappy. He’d told her to make sure she was strapped in three times already. Miei sat quietly, and tried to make sense of the numbers. The Epitaph cut through a couple of them, stablizers disguising whatever was going on outside. Her uncle cursed, short and brief, and a couple of the internal indicators started flashing green. That was never good. He was looking over his shoulder sometimes, obviously wanting to get up and do something about it, but unable to leave his seat. Miei unbuckled herself. ”I can fix it,” she annouched, and disappeared from the cockpit area before he had a chance to argue about it. She didn’t know a lot of mechanics just yet, but she knew how the ship was supposed to be. She’d been here a while, after all, and she knew what it was like when it was whole. She took a couple deep breaths, and unfolded her mind, searching for the places where it was broken. With her target area in mind, she ran through the short corridors and slipped into an access hatch, sliding down into the room she thought of as the ship’s core - where all the engines and power sources and generators came together. She didn’t think the ship had originally been built like that, because it was almost impossible for her to move around the machines, and she didn’t know how her uncle did it without some very challenging contortions. Miei slipped into the small areas, and found one of the control boards, the wires between it and the generator system shorted out. There had been… some sort of surge, when something had hit from the outside of the ship, and it had caused a chain reaction. We’re under attack, Miei realized, belatedly. That was what all the numbers on the display were, and what was happening with the ship and why it was broken. She’d just… she’d just have to keep it together. Her uncle could get them where they were going, if the ship held together. Miei sat down on the floor where the wires were, reaching out with her mind and pulling a wire stripper to her, catching it in her hand and setting to work. It wasn’t fast enough, though. The live wires kept discharging into her hands, but it didn’t bother her. It was just energy, and Miei knew how to deal with energy. She let it go through her, transmuting it and passing it out through the runes tattooed into the skin on her back. The ink was a special composite, Miei knew. Her mother had gotten it somehow, when Miei had been smaller - she’d never said where, or how - but Miei knew it was expensive, too much so. Her parents had argued about that. She still had a little of the ink, what was left. To be used if she needed it - but she wouldn’t need it if she could control herself. She let the runes do their work, and focused on doing hers. Eventually she abandoned the wire strippers entirely, just using nimble fingers and the power of her mind, reconnecting things and getting them to work as best as she could. The wires needed a connection, a place to be, and so Miei jammed the end of them into her leg. It hurt a little, when it broke the skin, but after a moment she didn’t feel it. She could feel the ship a little, though the wires. Oh… yes. Like that. She added a few more wires to her leg, to her arms, following the trails to the rest of the ship, feeling out where the damage was, where she needed to make it work again. The Epitaph came to life, and Miei let herself drift into it. The Epitaph was a better ship than she’d given it credit for, she thought. The best ships were people. Kir had never seen it before, and even he had to stop and stare. Terra. Their people held that they had originated there, and yet it was forbidden to them. There were other people there, now. It was their world, and the rules said it was not to be touched, never again. Of all the places in the universe Kir could have taken his little neice, it was probably the most illegal. It was also probably the last place anyone would look for her. He wasn’t sure what to do about her. They’d been getting along all right at first, and then during the skirmish (he hadn’t told her with whom, it would just worry her), he’d been busy and she’d gone to “fix the ship.” He’d found her later, somehow hooked in through the wires. He didn’t want to know how she’d done that. He’d helped her get herself detangled, carefully, and put her to bed, and completed the repairs alone, and not told her how freakishly weird that had been. It wouldn’t help. And… besides, whatever she’d done, it had probably held the ship together well enough for them to get through. They had come to an unspoken agreement not to mention it. Fortunately, the situation had not come up again. And now they were here, and Kir was… saying his silent good-byes. He didn’t think Miei had realized it yet, but the Epitaph couldn’t stay with them. He needed to take her into hiding, and that meant not having a traceable ship parked in their backyard - or whatever sort of yard they ended up with. He’d been stripping parts the last couple days - nothing too technologically advanced, but small things that would help out. Elements and wiring, because they were cheap and could be sold anywhere. They’d need a cash fund to get them started. He’d gotten most of it packed, and he supposed it was probably time. He called for Miei, letting her in to the cockpit one last time, toggling the computer system to autopilot, and locking the coordinates. He waited for her nod, and the tightening of her fingers in his hand, and then jumped. A few of the parts might have been a spaceship, once. Not enough to be recognizeable, but enough that it gets around. Built by Kir and Miei after they arrived on Terra, it was a joint project inspired by all the random heroics going on in the world. They're not really a traditionally heroic duo, but Kir was of the opinion that if someone was going to be wandering around blasting cities, he wanted to be able to blast back. He pilots, Miei powers. It also contains a small one-room living quarters. Guns: Plasma blasters, energy ray, railgun. Speed: 200mph, plus or minus, depending on how much Kir wants to redline it. They call it Epitaph 1.5, after the ship that brought them there. As a power-duo, Kir refers to them as "Epitaph One and a Half." He says he'll start calling them "Epitaph Two" once Miei is a little less tiny. She says he's just not ready to move on that much yet. Natural Suppression: While in Numinous Form, all of Miei's natural telekinetic abilities are suppressed. Ironically, this takes her from a mid-high tier to a low tier, but it also means she's less likely to spontaneously combust. Numinous Arrival: When something goes on that attracts the attention of her Numinous, she is dropped in by teleport, without much clue as to how that happened. Dragonflight: The Numinous of the Dragon grants the power of flight. Miei pointed out that she could already fly, but the dragon wasn't impressed. Apparently she wasn't doing it properly. Proper flight is like a river of smoke and silk, not like an oversized malformed bat. Also done properly, it can break the sound barrier. Dragonscale: Like most Numinous forms, Miei is more durable than average while in this form. That's not to say she can't be hurt, but she's more durable than your average guy. Extra scales protect vital areas. Wisp of Smoke: Miei's body becomes smoke. This is not the same as being entirely intangible, and if she gets blown away from herself, it takes a little time to recollect and reform. Still, it lets her not die sometimes - plus she can get through air vents and screens. Fear/Less: The smoke dragon is scared of everything by itself, but Miei is pretty brave. Combined, they are fearless - immune to fear and fear-inducing effects. They can also devour the fear of others to make them feel less afraid. Weatherworking: Rain and Fog - Miei can summon stormclouds either as a masking force, or to call down rain. She has some measure of control over the rain she calls, which pretty much means that she is going into battle armed with a squirtgun. Black Waters Rising: Ultimate attack, a targeted flood. Like all Numinous ultimates, Miei can do this once before she has to rest and recharge for a while.